Visual Studio Code>Azure>Service Fabric Mesh ToolsNew to Visual Studio Code? Get it now. A Visual Studio Code extension that provides support for building and deploying Service Fabric Mesh applications in Visual Studio Code. As VS Code is a lightweight editor, a number of dependencies must be first installed before Service Fabric applications can be created using VS Code. Open the VS Code application. Click on the extension icon in the explorer. Search for Service Fabric. Click install for the Service Fabric Mesh extension. The Service Fabric Mesh extension for VS Code helps developers to create and deploy Service Fabric Mesh projects using many commands. Commands can be called pressing (Ctrl + Shift + p), typing the command name into the input bar, and selecting the desired command for the prompt list. The deployment profile (deploy/deployment.json) can be created with the application Service Fabric Mesh: Create Application or with the standalone command Service Fabric Mesh: Generate deployment profile. The default generated parameters can be overrided with the extension configuration (see 'Configuration' chapter). Once generated, the deployment parameters can be changed (subscriptionId, resourceGroup, etc.) 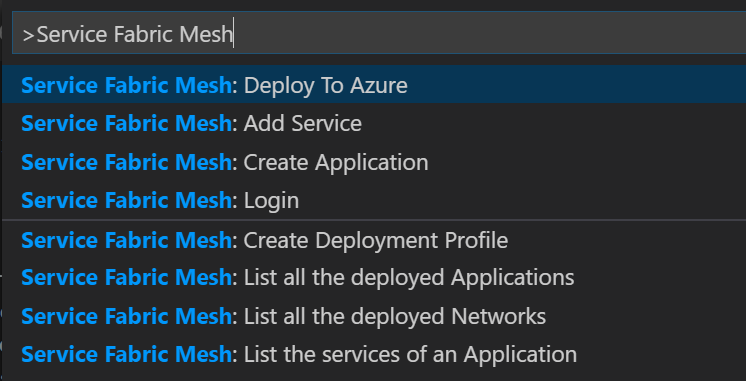 before using the Service Fabric Mesh: Deploy To Azure command.